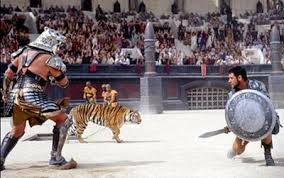 The 21st Century workplace is a modern day coliseum with employees as gladiators (okay, I'm being a little melodramatic). Work isn’t what it used to be and if you were lucky enough to be employed in the rah-rah 1980s or the go-go 1990s, savor the memories. Those days, like our youth, are gone forever. This Labor Day let’s take a look at the new implied work contract between employers and their workers. Every job really is an independent contractor position. Workers are increasingly responsible for more out-of-pocket expenses and companies are relinquishing their role in everything from training to health care. As 401(k) and 403(b) plans for nonprofits replaced defined benefit pension plans, employees became more responsible for their financial security when their work years ended. The downsides include the employer choosing the mutual funds in their plan which limits your investment options and the expenses related to them. Workers are at the mercy of stock market volatility. If that’s not perilous enough, now companies are doing the same thing with health care savings accounts. Employees set aside THEIR money in a tax-deductible fund to pay for current and future health care costs. My advice? Don’t get sick with one of these plans. Combined with a high deductible health plan companies are offering, you’ll be ill and financially insolvent. Now, employees have to train themselves. That’s right, few to no company-sponsored professional conferences and external training classes are available unless it is a regulatory requirement. Many of my former training and development colleagues are among the unemployed or under-employed. The mantra goes like this: (Shouted by management) “Who is responsible for my professional development and training?” The employees in unison are expected to chant in reply, “I am responsible for my development and training.” This is serious stuff, I heard about a company doing this. Companies often tout tuition reimbursement as a perk, however, once inside the company employees get to read the “fine print.” The courses must relate to the current position you hold (no working on your Masters in Fine Arts in the accounting department) and in some cases you must have a certain performance appraisal rating to qualify for tuition reimbursement. And as the cherry on the T&D sundae, your request must be approved by your manager and their boss (who are going to wonder where you'll find time to complete an outside course of study and do your job). Organizations hire employees to do the task at hand and provide minimal cost-effective training to maximize task without injury (workers compensation expense) and required sexual harassment and diversity training (lawsuit prevention). In 2011 a study appeared in the journals and the media titled, “Do Nice Guys and Gals Really Finish Last?” Spoiler Alert: Yes. The University of Notre Dame, Cornell University and University of Western Ontario professors found that men who disagreed with co-workers more the most made 18% more or close to $10,000 above their more collaborative colleagues. The study examined data over 20 years and included more than 10,000 employees from three previous studies and appeared in the Journal of Personality and Social Psychology. The proper term for a workplace jerk in academia is “disagreeableness” and that is what their study focused on, however, it is the same traits that make more agreeable employees cringe. More recently, The Workplace Bullying Institute—yes, this place exists—reported 35% of the U.S. workforce (over 50 million employees) admitted to being bullied at work. So, if you feel the workplace has lost a bit of civility and your co-workers are rude, your boss cuts people down in front of others or senior management has instituted a threatening culture, there’s research that says that’s the direction companies are headed. And, yes, disagreeable women make more money than nice ladies, so wipe that smile off your face. There’s more in Part Two of Unhappy Labor Day. I can relate to the loss of civility at work. Folks in a position of power definitely see nothing wrong with being rude and cutting employees down in front of their peers. This is a regular practice. You either learn how to cope or you leave - those are your options. Funny how the company owners still have not comprehended why there is a constant revolving door! Great article. Waiting for part 2! Thanks for your comment! Lack of common sense and corporate training leads to the manager who cuts employees down publicly. Not only are employees not trained, management training is scant in many organizations. It often focuses on the legalities of interviewing and employee discipline. It is very difficult for companies to assess their poor managers and develop or find other positions for them because senior mgmt doesn't like to admit a bad hire or promotion.